Yesterday we had to run to the store early in the morning for something for Kade to take for show and tell. He and I were still in our pjs. I don't usually do that kind of thing. He was supposed to bring in something about space (we have some cool stuff from the Kennedy Space Center but of course it's buried in the storage unit) or something that starts with the letter S. We ended up getting a slinky. CVS didn't have anything space related and I didn't have time to run to Walmart since I had to get Mattey to school. 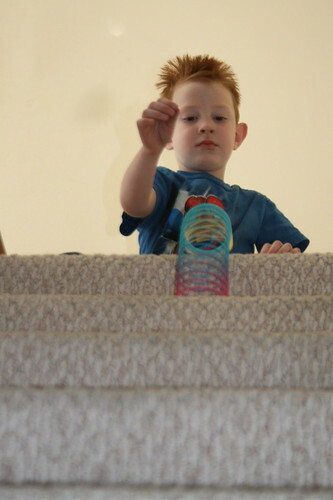 Kade was thrilled with the slinky. He has been playing with it non-stop. Yesterday he learned how to make it "walk" down the stairs. I had him do it again for me today so I could get a picture. Check out his spiked hair. He and Mickey got haircuts this afternoon while Meg was at practice and I took Mat to the orthodontist. What a crazy afternoon we had. The evening calmed down with a dinner of lasagna and some scripture reading.